Vintage One: 20 years of Mtn Bike passion and counting. : Tour De Diligence: Packing for the journey. I had purloined my h-bar bag and seat bag from the bikepacking dedicated Lenz Lev 3.0 and transplanted them onto the Salsa Spearfish. 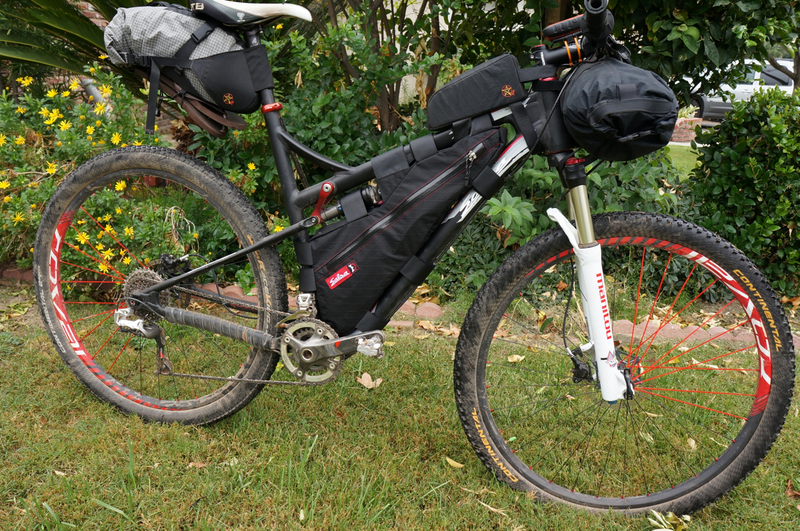 I also grabbed the Fuel Tank and added the Salsa/Revelate co-branded frame bag. 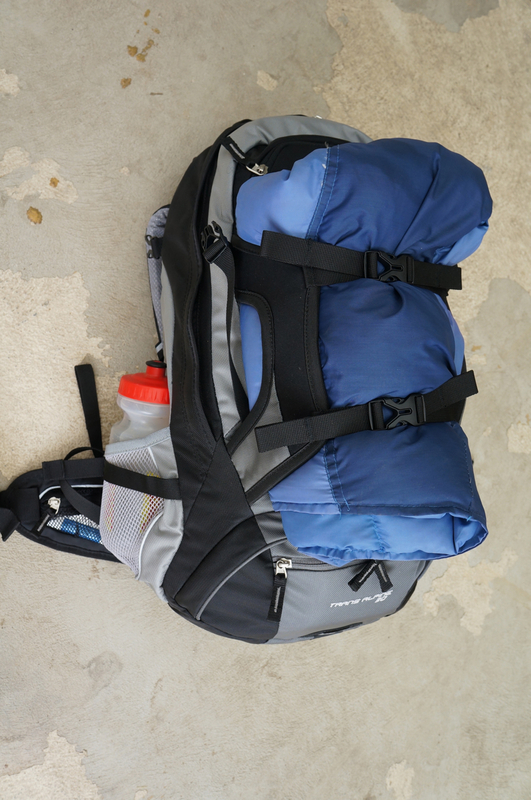 Then, what would not fit in there was stuffed into the 'on-test' Deuter Trans Alpine 30 pack. 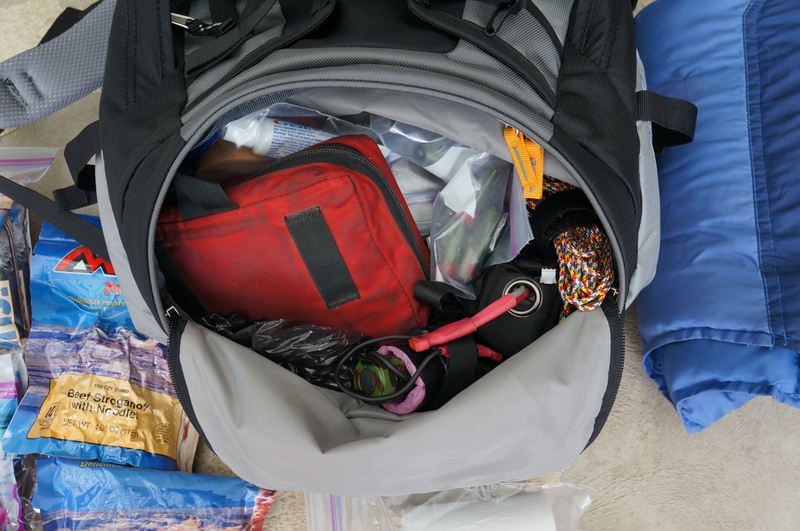 I have a lot to learn about packing efficiently and I learned some of that this trip. 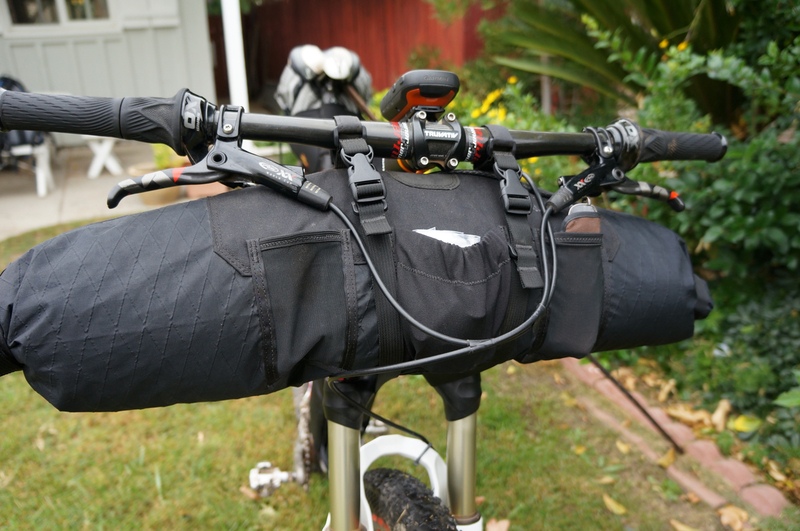 For one thing, I learned that dense weight should be on the bike. So water and food is a biggy there. I had too much water and all the food in the pack. The pack was 25lbs. Too heavy. At the meet-up point I realized this and moved the 3.0L reservoir out of the pack into the frame bag and the pump and kitchen stuff into the back pack. That helped. The third day I moved all the food into the seat bag and the puffy but lighter things like sleeping bags, etc, into the back pack. I bet that made a 10lb difference and that was greatly appreciated. 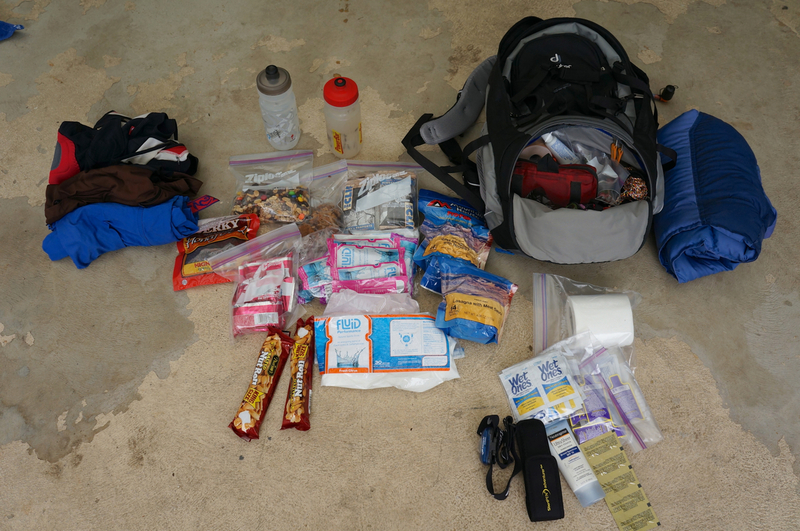 In the main section of the back pack: two trail meals, several days worth of drink supplements from Fluid and Clif Shot, trail mix, oat bars, etc. 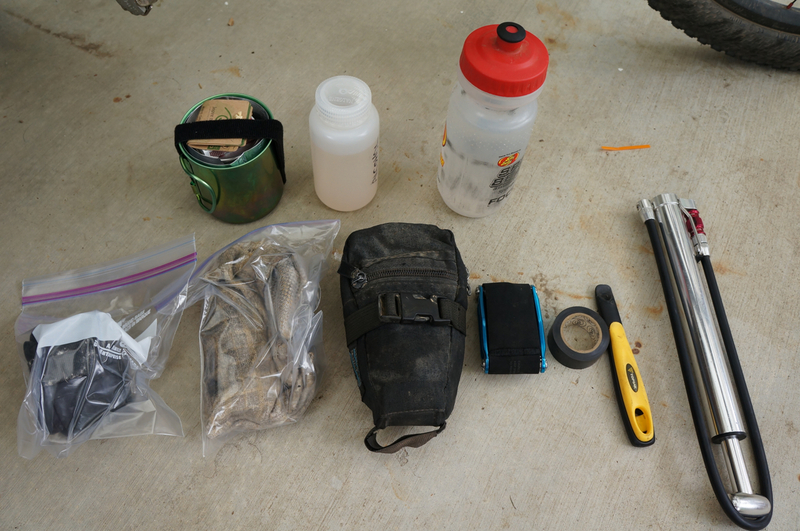 Water filtration/treatment, TP and trowel, sunscreen, wet wipes, two water bottles + 3.0L reservoir, candy bars, etc. Change of clothes, night clothes, camp light, vest strapped to outside. In the sub-floor of the pack: emergency-first aid kit, head light, batts x2, trash bags, cord, spare GPS batts, hygiene, etc. All packed up and weighing a ton. In the seat bag to begin with: 1lb 50* bag, silk liner in case, fleece head cover, vest. In frame bag to begin with: Spare tube, tool kit in normal seat bag (another tube, chain links, etc), multi tool, tape, pump, tire irons, kitchen (stove and cup, matches, fuel, chain lube and rag. The beast ready to go. Bike weight about 45 lbs. The Salsa-Revelate frame bag was excellent. It did require removing the cage. The CDW seat bag with my son's flip flops stopped underneath. 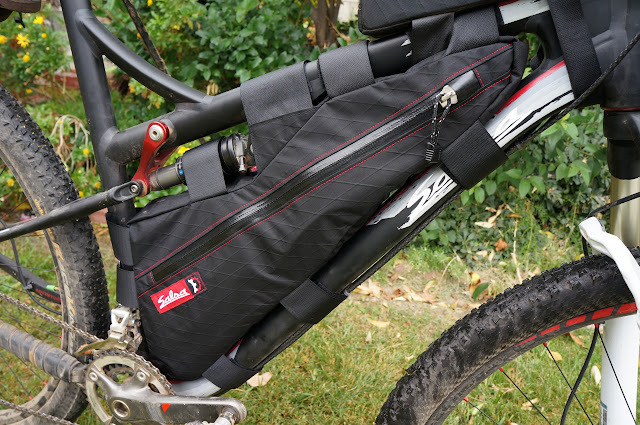 CDW Bar bag. 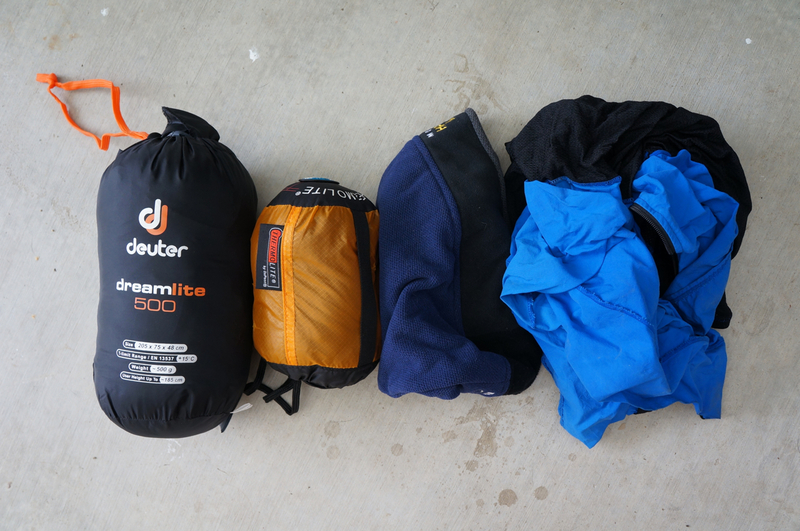 I guess I did not take pics of those contents, but I had the REI bivy, ExPed sleeping pad, pillow/pump, Tyvek ground cloth, and things like arm and leg warmers and windbreakers at the ends for easy access. Now the dynamics of this changed a lot during the trip. As I said, the water bladder and water bottle went into the frame bag and I swapped food from the pack and the heavy first aid kit into the seat bag and the sleeping bag, etc, into the back pack. Live and learn. 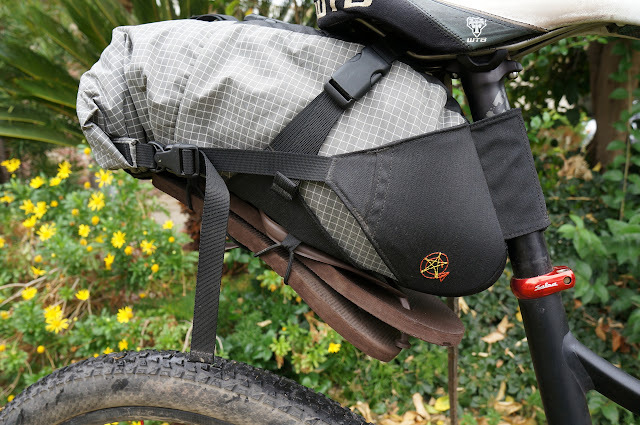 Watching the more experienced bike packers approach was enlightening. I have a lot to learn. Next up, we hit the trail with expectations of a long week. Little did we know.